In the same way as the things you carry vary according to the terrain you hike, international backpacking requires some adjustments. 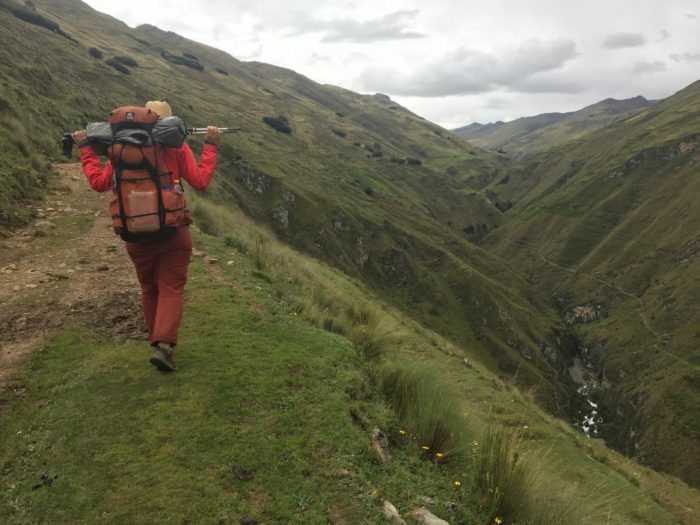 I have been backpacking the length of the Andes since 2015 and these are five adaptations which have improved the experience greatly. Fortunately, as compared to things like language and culture, changes in gear are light and painless. They are mostly carried ‘just in case’, but the difference they make in access, safety, and enjoyment more than makes it worth it. 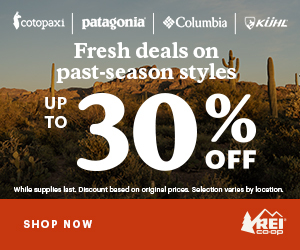 Any good backpacking trip means getting out past the bounds of convenience. In international travel this means remote resupplies. If your route passes through small foreign towns, do not expect credit cards nor change for big bills. Make sure to get change and small bills in the local currency when you are in larger cities. This breaks with the typical in-country thru-hiker policy to avoid hiking with change. A second thing to carry is credit cards from two different companies. Throughout South America we found the most frequently accepted card is Visa but on several occasions the Visa system was down in some of the cities we passed through, making that card useless, in which case our American Express card came out to save the day. This double card policy is also useful in case of theft. Being robbed is always inconvenient. Being robbed while abroad can be a game ender. Also, if you happen to hike through a poor area of the world where desperation is higher, you will be profiled as a “tourist” and the possibility of being targeted is high. For example, one time I was talking to some school children in Peru and one of the girls asked me to give her money. I replied that I did not have any. She said, “yes you do, I can see coins in your pocket.” The rest of that stretch I was very aware the community knew I had money and was walking trails the knew far better than I. As such, we carry “fake wallets.” In some of the more dangerous areas of the world I also recommend carrying a burner phone. People will never believe that as a tourist you have no phone but if you have a less valuable phone, it makes you less of a target. Default to knowing that any time you take money out of your wallet, someone is counting how much is there. In our fake wallets we keep small bills, one credit card, and a form of ID which is not cataclysmic if stolen. We keep our passports, a backup credit card, and the bulk of our cash hidden in a secure location on our person or in our ruck. 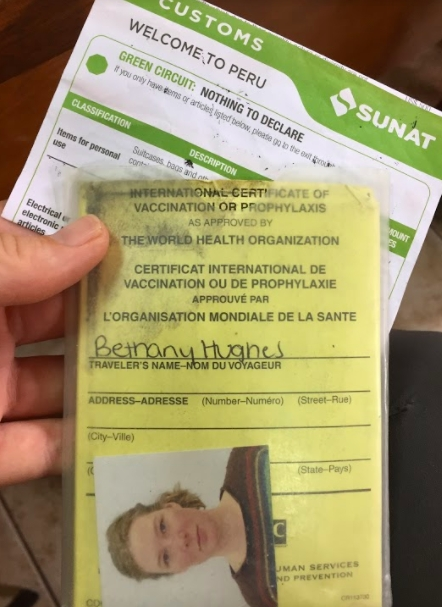 As mentioned above, when backpacking internationally, it is wise to carry a few kinds of ID in various locations of your kit (one immediately accessible, one tucked away). Also leave photocopies or digital files with a trusted person who knows where you are. Before traveling abroad, also know the vaccination requirements and carry your vaccination records, which may be requested by border agents. I have had good luck carrying both a passport and a passport ID card for casual use at grocery stores and hotel check ins. Medicines which can only be obtained at great cost and by prescription in the US are often readily and cheaply available over the counter in other parts of the world. This ranges from Flagyl to Rabies Vaccines. What you cannot readily obtain is the knowledge of when and how to employ these options. Before we set out to hike we got WFR certified, and enlisted the help of a friend who is a medical professional to advise us when illness arises. Again, expensive and complicated from the US, after a few years of hiking abroad we learned that it is cheap and easy to get our phones unlocked at a kiosk in a large international city, then we buy chips for our phones in each new country which provides a set amount of gigs and easy connectivity from the field. They are easy to recharge for periods ranging from 1 day to 1 week for less than a dollar a day. This makes accessing google maps easy which is a valuable resource when arriving to and navigating a foreign city, comparing lodging options, etc. I also recommend getting WhatsApp on your phone, as this is one of the most prevalent and cheapest forms of contact internationally, is usually unlimited on phone plans, and is the first form of messaging to go through when signal strength is weak. International backpacking is a wonderful way to see the world and experience it from a different angle than most tourists. Accepting that you will still be regarded as a tourist and therefore, relatively wealthy, means making some changes to how you do things but if you plan ahead, stay aware, and take precautions, it can be a much safer and more comfortable experience than you might think. I’ve mostly stopped looking at ‘The Trek’, as the articles seems to be almost entirely of the “why I’m hiking trail X” “we got our trail names” or similar no-content variety. So I want to particularly call out when someone posts something USEFUL, and this is. Thanks! The idea of the fake wallet in particular is one that I hadn’t considered. W.r.t. medicines bought in less wealthy countries, I would be concerned about the efficacy or even authenticity of the medications, but perhaps that’s just my ignorance on the topic. Seems like lots of other considerations, and your focus here was on the high points, calling out the most important things. But I assume some things are similar to hiking in wealthier foreign countries, like get your cash from an ATM that’s at a bank and hopefully in a place where surveillance cameras are in place to avoid ATM skimmers. Be flexible in what you’re willing and able to eat, but maybe also strategies in resupplying to avoid getting ill?? Heck, resupply on a longer backpack means I presume that you have to have local villages/towns in walking distance of the trail. How safe and practical is hitch-hiking? Language issues. Safety in general, to include country-specific issues. Chile should have been pretty safe for you, and I guess Sendero Luminoso is not a factor in Peru anymore (! ), so maybe nothing like that in the Andes these days? Sounds like a hoot, anyway, thanks much for sharing! Brian, what delightful feedback and insightful thoughts. Re Meds- you thoughts are not unfounded, I would never purchase loose pills abroad. The Flagyl come in pre-wrapped packets and I always insist on seeing the box, I take a photograph of the ingredients list and we send that our our medical adviser who has access to medical dictionaries and he gives the greenlight before we start ingesting anything. I have had 2 friends who have had to get the rabies vaccination series while down here and neither have gone batty or foaming at the mouth. At $10,000 PER DOSE in the US and with the tight timeline, it is really the only option for someone who has been bit. Re ATMs- Again, a wise perspective. While there are not many cameras and we sometimes don’t have the option of a bank ATM, I keep the same policy as I do when purchasing open cheeses in the villages, I watch where the locals go, and then follow their lead. We have also been warned to wipe our finger prints off the keypads and if anything seems off about the machine, we go elsewhere. Re diet- One of the delights of this kind of travel has been learning new foods and ways to prepare them. Polenta in Argentina. harina tostada in Chilean Patagonia, quinoa for mere pennies to the handful in Bolivia, ceviche in Peru, now the platanos in Ecuador. 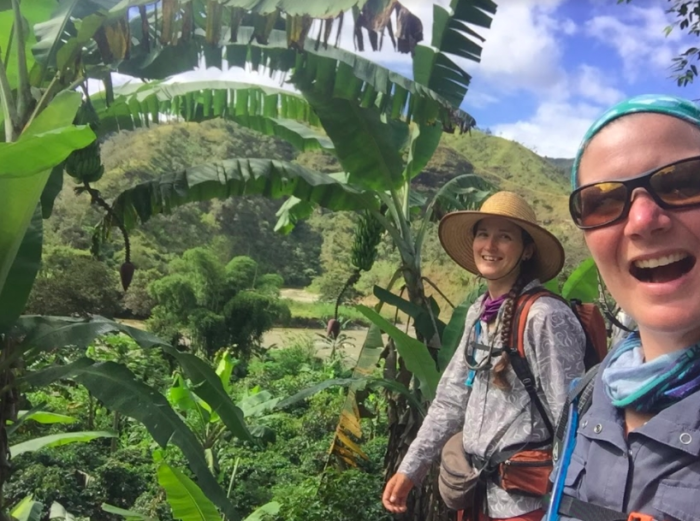 Adapting diet is important and would make a venture like this difficult for a vegetarian, though, closer to the equator there are a lot more plant based options than there was in Patagonia. Re Resupplies- that would an entire chapter with topics such as harvesting and trading. It’s an adventure, lets say that. Right now I have my eye on the ELN in Colombia. That Ecuador/Colombia border crossing is going to be a gambit so we are watching the elections there closely. Thank you for your thoughts and, again, the positive feedback. It is so encouraging. Lolol. You make the entire world sound like one place. You know you aren’t more likely to be robbed in most countries than in the US? Perhaps learn about the places you are going and stop traveling like a rude American.